The Navagraha Pooja is important as the planets are considered to playa major role in deciding the destiny of man. All the nine grahas (planets) have the vital role to give us pleasure' or pain in life. In astrology, great importance is placed on the positions of the "Navagraha" in the twelve constellations of the zodiac, their planetary movements and their effect on human beings. A particular "graha' may be beneficial or adverse in a person's horoscope. In the latter case, prayers to the particular graham are said to remove' the ill effects. Lord Surya was worshipped by Lord Rama before the war against Ravana. His grace is believed to lead to power, position, good health and so on. Chandra's grace is required tor the health of the mind and consequently the body. The "Rasi" in a horoscope is decided by the position 01 the moon, just as the "Lagna" is ruled by the Sun. Lord Angaraka, is the moulder of leaders of countries. He graces those who stand up for truth. Lord Buddha, is the giver of Wisdom. He imparts knowledge and beauty, prayers to Lord Guru can alleviate the sufferings brought about by adverse positioning of any of the "Grahas". Guru is the Lord of the Devas associates with wisdom, Vedanta jnana, purity of thought, word and deed. Fortunate beings are those with Lord Sukra strong in their horoscope. Sukra is proficient in all the Sastras. He can even bring the dead back to life. Sanaischara is a beneficent "graha" Any adverse effect is due to placement in an individual horoscope which could overcome by worshipping him. Rahu and Kethu, also do a lot good. 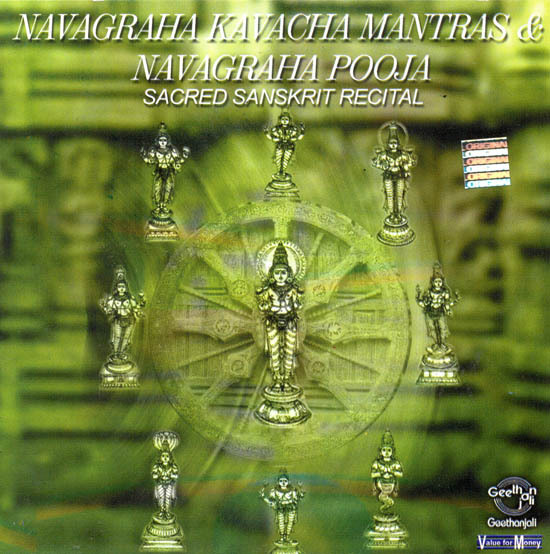 This compact Disc Contains Sri Vighneswara Pooja, Navagraha Pooja (can be performed on any day) and the kavacha Mantras for all the Planets and Mangalam. These are recited by Prof. R. Thiagarajan the Head of the Post Graduate and research department of Sanskrit presidency college. Chennai along with his team Sri P.S. Raghuraman. Sri Malolakannan and Sri Sivarajan with the technical support of the famous Music Director Sri V.R. Manickavinayagam. Super Audio (Madras) Pvt. Ltd. Feels proud to place this Audio presentation for all the devotees the to enjoy a prosperous and peaceful life.